Photograph by: Dwight Bohnet, National Science Foundation. 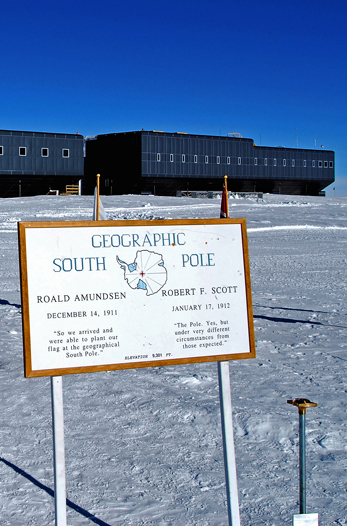 The brief quotations on this sign at the U.S. Amundsen–Scott South Pole Station are from the diaries of Amundsen and Scott soon after they arrived at the Pole, on the dates shown. The silver pole on the right, with the bronze disc on top, marks the geographic South Pole. The main South Pole station building is in the background. One of the great, tragic tales of polar exploration is also part of the story of how scientists unraveled the story of earth’s ancient history and how the continents move. Chapter 2 of The AMS Weather Book briefly describes how the continents move. The book also tells how fossils found with the bodies of the British explorer Robert Falcon Scott and two of his companions, in 1912, helped confirm the hypothesis that the continents are moving. The deaths of Scott and those with him were the culmination of the race to be the first to reach the South Pole between Scott and his British party and the Norwegian expedition led by Roald Amundsen. The two groups followed different routes from the Antarctic Coast, where they traveled by ship to establish base camps to launch their journeys to the South Pole, roughly 800 miles away. Since no plants or animals live on Antarctica’s ice the explorers had to carry all of the food they would need and enough fuel to melt ice for drinking water and cook their food for the entire trip. The Norwegians, who left their base camp on October 20, 1911, traveled on skis and used sled dogs from Greenland to pull sleds with their supplies. The British explorers, who left their base comp on November 1, walked all of the way and pulled sleds with all of their supplies for almost all of the round trip. Amundsen and the four men with him—Sverre Hassel, Helmer Hanssen, Oscar Wisting, and Olav Bjaaland—arrived at the South Pole on December 14, 1911 where they planted a Norwegian flag and set up a tent, which they left when they started back. All safely returned. Scott and the four men with him—Henry R. Bowers, Edgar Evans, Titus Oates, and Edward A. Wilson—left their base, located on the site of today’s U.S. McMurdo Station, on November 1, 1911. They reached the Pole on January 17, 1912, to find the tent Amundsen’s party had left with a letter inside addressed to the King of Norway and a note asking Scott to please deliver it. On the way back, first Evans and then Oates died. Finally in March, Scott, Bowers, and Wilson became trapped in their tent by a blizzard only eleven miles from a cache of food and fuel that could have saved their lives. Others in Scott’s expedition could only wait until spring in their camp to search for the missing men. In November 1912, they found the bodies and the sled with exposed film, Scott’s diary, and the fossils. The search party removed the tent poles and allowed the tent to drape over the three bodies in their sleeping bags. They built a cairn of snow and topped it with a cross made of skis. It was, they felt, a fitting tomb. A National Geographic Kids’ Web story is a good, brief account and includes a map and a few photos. The Antarctic Connection Web site has a side-by-side time line of the Amundsen and Scott trips and a more detailed map of their routes.